Strong, square lower jaw had always been credited as a masculine feature while a smooth, narrow, delicate V-Line face signifies femininity. For those of Caucasian origin, strong jaws, even for women compliments their facial features with their aquiline nose and deep set eyes, but for Asians with typically small noses and small or single lid fold pair of eyes, a wide jaw does not actually harmonize with their features. Unfortunately, the prevalence of large jaw is quite high among Asians that jaw reduction surgery in Thailand has been an in demand procedure for years. 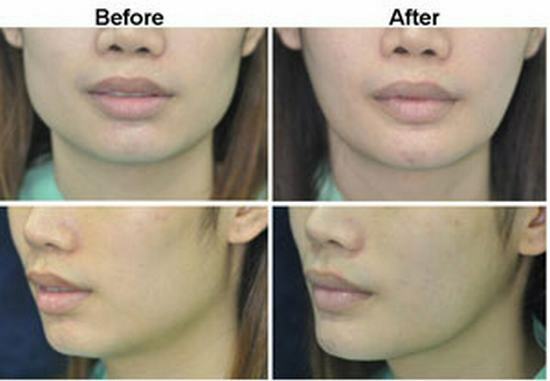 HOW IS JAW REDUCTION SURGERY in Thailand PERFORMED? Jaw Reduction surgery is an invasive surgical procedure that is always done under general anesthesia and usually takes about 2-3 hours. Incisions for jaw reduction surgery in Thailand can be placed inside the mouth or at the back of the corner of the jaw but to avoid visible scarring, Prof. Kunachak performs the technique using an intra-oral incision most of the time. Jaw Reduction Surgery in Thailand involves reshaping the bone around the corners of the jaw and adjusting the shape of the chin to provide a narrower, softer, more feminine appearance. It is thus particularly effective in changing a square-shaped face to a more oval contoured one or what is now popularly coined as the V-Shaped face. In some instances the jaw reduction surgery may involve reducing the masseter muscles to further narrow the the Jaw Line. This is also a procedure done in our surgical center in Bangkok. Having the mandible (jaw) contoured reduces the appearance and size of the jaw, making it rounder and narrower at the corners near the back of the jaw and along the chin, thus giving a softer touch to a previously fierce facial contour. V-Line or the V-Shape contour that is the current trend in facial contouring can also be accomplished by a combination of Cheek Reduction and Jaw Reduction surgery in Thailand. Post-operatively, patients may wake uo with drains to facilitate expulsion of excess blood, this is done to facilitate faster internla healing. These drains are typically removed before the third day after surgery. Pain, swelling, bruising, and numbness on the area will be normal for the first 4 weeks since the surgery will involve bone shaving, however, your surgeon, Prof. Kunachak, and his team, will provide you with medications such as pain relievers, antibiotics, and anti-inflammatory to make sure your recovery will run smoothly and comfortably. Like Chin and Cheek Augmentation surgeries using implants in Thailand, the incision is placed inside the mouth. The chance of infection is theoretically higher for jaw reduction surgery but this is avoided with prophylactic antibiotic and careful guidance to post-op patients. Incidence of infection following jaw reduction surgery has also never happened in our facility due to the strict after care treatment we offer all our patients. Soft diet is highly recommended for the first few days after surgery to facilitate faster healing. Alcohol based mouthwash or oral cleansers are highly discouraged for at least 1 week as the alcohol content may irritate the incision. WHAT ARE THE RISKS INVOLVED IN JAW REDUCTION SURGERY in Thailand? Like all other surgical procedures, Jaw Reduction Surgery carries some risks though with proper assessment and a good choice of surgeon, these risks are minimized. Some of the possible risks however are excessive bleeding, infection, numbness on the jaw and lower lip area due to nerve damage and asymmetry. All risks are however minimized and avoided by meticulous attention to details by Prof. Somyos Kunachak and his team. 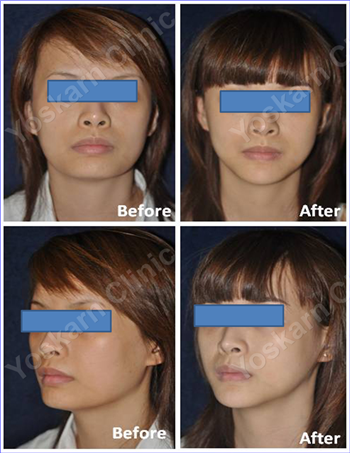 WHAT KIND OF RESULTS CAN YOU EXPECT FROM JAW REDUCTION SURGERY in Thailand?? Since Jaw reduction surgery involves shaving, rasping, or cutting of the bone plus on most cases reduction of the muscle as well, the surgery guarantees a visible slimming of the jaw area, however, it may take 4-6 weeks before patients can start to appreciate the result due to swelling. Patients who used to have a squarish face contour can expect to more oval contour that looks more feminine. Understanding the risks and recovery time associated with this surgery, our team provides full service with hotel accommodation though the number of nights included in our surgical package, patients can still choose to stay at Aphrodite Inn for an extended period. Aphrodite Inn is an affiliate hotel of Yoskarn Clinic. The 2nd floor of the hotel was modified to suit the needs of post-operative patients from Yoskarn Clinic. Those who are staying at Aphrodite Inn either before or after their surgery enjoys the benefit of both being around the shopping center of Bangkok and having nurses and doctors within easy reach round the clock. Companions are also allowed to stay in the same room with the patient after surgery free of charge. The restaurant on the 1st floor serves Thai and International cuisine with room service. Breakfast is complimentary for the patient and the guest. We also offer transportation service and tour packages for companions of our patients and our patients themselves once they are strong enough to have their Bangkok adventure.